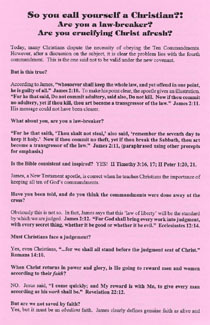 Today, many Christians dispute the necessity of obeying the Ten Commandments. Christianity is built on the truths of the Bible, so if a person does not believe in following the Ten Commandments, are they really a Christian... or just a hypocrite?! Do YOU call yourself a Christian? Read this tract to find out how you can make sure you really are! First copy FREE, additional copies $.05 each + S/H.